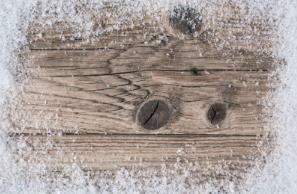 Winter can be hard on your hardwood floors. From fluctuations in the home’s humidity to tracked-in moisture and other debris, by the time spring rolls around your floors may be in desperate need of a refresher. Thankfully, there are ways to get your floor the restorative treatment that it needs to perk back up to its beautiful, glossy self. Read on to learn more about the particular challenges of winter, how they impact your hardwood flooring, and what you can do to revitalize your floors for the spring. Cracks and separation are some of the top complaints of homeowners who’ve weathered a cold winter with their hardwood floors. From variations in temperature and humidity to extra salt and grunge tracked in on winter boots, wood floors can have very noticeable gaps between boards by the end of winter. In older homes, this gapping may be permanent and unavoidable. Years of use and dirt accumulation between boards eventually creates separation that can’t be reversed. 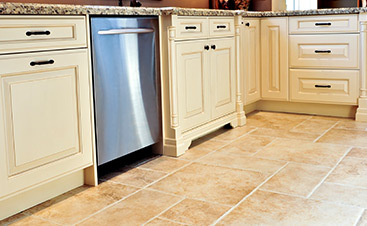 For younger floors, however, a good cleaning can help the gaps disappear after a long winter. Boards separate due to a reduction in indoor humidity that causes them to dry out. Dry boards pull apart from one another as the wood itself shrivels slightly due to the loss of moisture. When each board shrivels individually, it creates long gaps between each board on the floor. Board cracks occur as a similar problem resulting from the lower humidity levels. As the floorboards lose their moisture, they become more brittle and prone to cracks from use or even from age. Floors with lighter stains will show these cracks more compared to their darker counterparts. Cupping occurs when floors dry unevenly after being wet. Cupped floors appear somewhat how they sound – each board cups up like a “U”, giving the floor a somewhat wavy or rippled effect. When floors are wet and different board sections dry before others, cupping is likely. This phenomenon happens as the top of each board dries before the bottoms of the board do. The tops contract, while the bottoms remain swollen and moist. Depending on how widespread the water damage is, it may impact the entire floor or just a portion of it. You must determine the source of the damage to understand how far the cupping may extend. If it’s the result of one big water event, then it shouldn’t spread any further. If an appliance, such as the dishwasher, causes the flooding, then make any necessary repairs to that appliance to prevent future damage to your floor. Crowning is a similar problem to cupping. 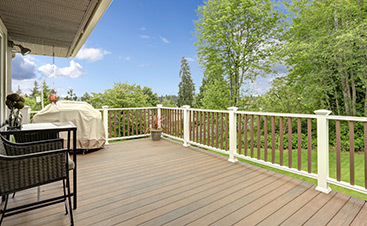 It’s the result of an imbalance moisture level throughout the thickness of your wood. Crowning is structurally and visually the opposite of cupping and results in flooring that appears to have a mound along the middle of each board. Crowning occurs when boards dry at the bottom, while the top remains moist. This causes the bottoms of each board to contract as the top remains saturated and swells. Solve crowning by eliminating the offending water source, if applicable, and drying the wood entirely. Then boards can be sanded down to a uniform level and refinished for a smooth surface once again. Buckling floors are a serious, though thankfully rare, issue. This problem occurs when the hardwood flooring pulls away from the subfloor for some reason. Typically, flooding or other water damage leads to this situation. Improper installation or subfloor deformities can also cause buckling. 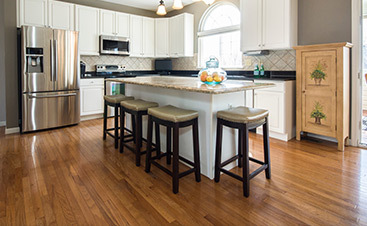 Addressing buckled floors immediately can save your hardwood and the appearance of your home. Once you’ve addressed any major floor issues, take some time to implement simple measures for keeping your floors looking their best. A huge factor in the life and health of your hardwood floors is your home’s humidity levels. If you have a large amount of your home decked out in hardwood, consider investing in a house-wide humidifier that works through your HVAC system to regulate indoor humidity during every season. Many locations experience humidity levels during the winter that are less than what’s considered the “livable level” when it gets too dry. Not only is this unpleasant for your personal health and comfort, but it’s disastrous for your beautiful hardwood floors. Of course, enough cannot be said about the importance of regularly cleaning and maintaining your hardwood floors. Properly installed and stained floors can withstand the daily wear and tear that your family may bring. Regular sweeping, vacuuming and dry mopping help maintain the hardwood floor’s luster. Don’t use a wet mop on your hardwood as it can cause some of the moisture damage we just talked about, and it could mar your floor’s finish. Consider investing in a floor cleaning system that specifically treats your boards with a lovely spring cleaning. Have a professional repair and refinish your wood floors for a fresh spring look.